Because of the support of our valued members, the Laurentian Chamber of Commerce is able to provide many services to representative businesses in our community. These privileges, of course, coincide with a Laurentian Chamber membership. If your employer is a chamber member, you can attend any of our chamber events (Breakfast Connections, Lunch & Learn, Business After Hours, Annual Dinner, Golf, Curling) at a reduced chamber member rate. You don’t need to be the boss or CEO of a company to attend, though, of course, they’re welcome, too! All are welcome! Any chamber member can be part of our chamber committees, including: Legislative Affairs, Business, Membership Outreach, Emergent Community Leaders, Policy & Bylaws, Curling, Golf and Annual Dinner. If your business is a chamber member, you receive two (2) free eblasts per year to promote your business. These eblasts reach nearly 700 people within the Laurentian Chamber community. Your annual chamber membership includes the opportunity to connect and network with hundreds of business people throughout the Laurentian Chamber community. 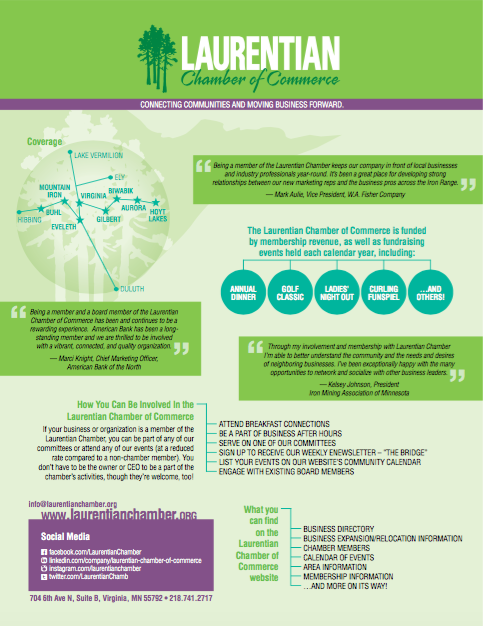 A chamber membership includes links from our improved Laurentian Chamber website to your site. Additionally, a chamber membership includes a listing within our NEW Laurentian Chamber business development/expansion/relocation packet. These packets are available in the chamber office and are available to any city, business, developer, etc., looking for demographic, financial incentive, transportation and quality of life information within the Laurentian Chamber community. Participation in value-added Laurentian Chamber campaigns – like our “Small Business Saturday” campaign, and others. To learn more about the privileges of being a member of the Laurentian Chamber of Commerce, please email the chamber or call 218.741.2717.